While Columbia led America into chainless cycling, the market leader in Europe was Fabrique Nationale (F.N) of Belgium. 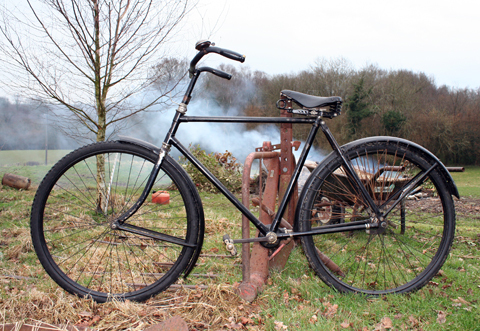 The F.N Chainless was a top quality bicycle, as you would expect from one of the world’s top arms manufacturers. In fact, it was made using an identical principle to F.N gun manufacture: lightweight but robust; smooth operation in use; high-quality components that fit together logically and can be dismantled easily; a minimum amount of moving parts; and maintenance that you can do yourself. Great Britain and Belgium were long-time trading partners and the FN was widely promoted in Britain; such was the success of the FN Chainless that only a few British manufacturers bothered to make their own chainless models to compete against it. After WW1, the FN was the only chainless bicycle on sale in Europe. Chainless bicycles were more expensive to manufacture than conventional bicycles. Although FN at one time claimed a production rate of 1000 per year, comparatively few chainless machines were made. 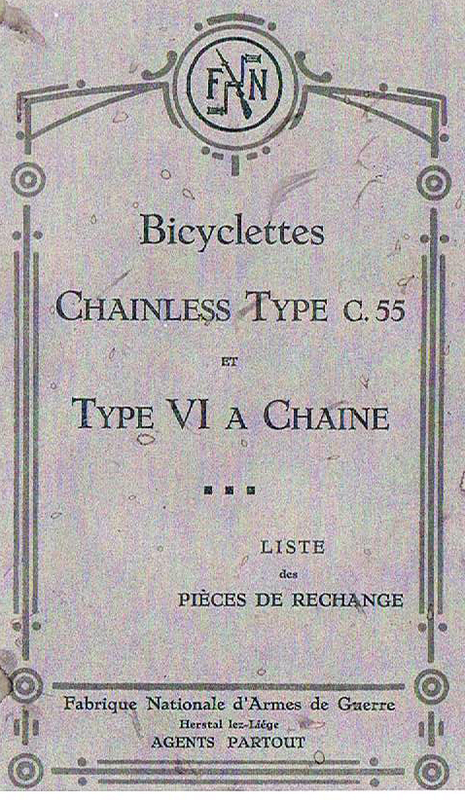 So, 90 years later, chainless bicycles are very collectible. As well as being very collectible, and a good investment, a 90-year-old FN is a practical vintage bicycle for regular riding. Without the added weight of chain and sprocket, the FN is light to carry. This example was mechanically restored by my friend Robert, the previous owner. It’s in excellent working order and is ready to ride. The paintwork is original, including its FN head-badge. Weapons manufacturing in the Belgian city of Liège began as early as the 16th century. By the second half of the nineteenth century, the city featured a number of prominent arms manufacturers. In 1886, a group of manufacturers, including Ancion, Dumoulin Frères, Dresse-Laloux & Cie., J. Hanssen, and Pirlot-Frésart joined together to form an association, Les Fabricants d’Armes Réunis (United Arms Manufacturers). An order from the Belgian Army in 1887 for 150,000 repeating rifles encouraged Les Fabricants d’Armes Réunis to begin planning a new, large scale factory, and in 1888 the group created a new company, Fabrique Nationale d’Armes de Guerre. The new factory was built in Herstal, and in 1889 the company launched production of the Belgian army order, producing Mauser-designed rifles under license. Mauser, based in Germany, then bought up the company from its founders. At the completion of that contract, the Belgian army returned to the company, later to become known as FN Herstal, with an order for 30 million rounds for the Mauser rifles. FN Herstal promptly set up a dedicated munitions factory next to its rifle production site in 1891. FN Herstal soon expanded its production to include civilian arms, especially hunting rifles. By the mid-1890s, the company began seeking other production areas, and in 1896 the company launched production of its own line of bicycles, including its own “acatene,” or chainless, shaft-driven bicycle designs. The company would remain a popular producer of bicycles for some 30 years. From bicycles, FN Herstal entered the young automotive market, producing its first car in 1900 and its first motorcycle two years later. FN also provided proprietary engines for other companies. Vindec was one of several companies using FN engines in the early days. Below you can see an advert from The Motor, 25th March 1903, illustrating a Whippet with an FN engine. The 2-speed gear is not attached to the motor but to the pedalling gear of the bicycle. (Picture and info thanks to Leon Mitchell http://users.senet.com.au/~mitchell/index.htm). While the company stopped producing cars in 1937, it continued to build motorcycles into the 1960s. In addition, FN Herstal became a prominent truck manufacturer, with production running from 1930 to 1966, and also built trolleys between 1932 and 1955. Closer to its core weapons production was the manufacturing of military vehicles, and activity in this area continued until the early 1980s. Its diversified product line notwithstanding, FN Herstal achieved its greatest renown as a maker of small arms. According to the advert at the top of the page, from Cycling magazine of 20th November, 1919, the address of F.N. (England) Ltd was Kimberley Rd, Willesden Lane, London NW6. “These makers, who have specialized in the shaft-driven motorcycle, show a very attractive pedal cycle with this form of power transmission. Although only a sideline in the F.N business, these chainless bicycles are so popular on the Continent that the factory possesses facilities for a 50,000 output annually. The machine shown is an entirely new model.” (Sadly, no illustration provided). The FN Herstal company still exists as a firearms manufacturer, and is located in Columbia, South Carolina.